Well, Brynn was activated on her left ear today! We'll save the right ear for later, depending on her reactions and tolerance levels as we progress. 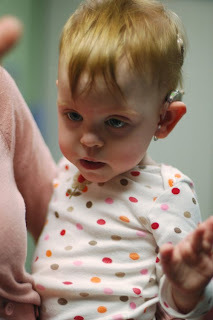 First, the Audiologist only stimulates the implant with the computer, so Brynn doesn't hear voices or other environmental sounds--just some pulses sent to each of the 22 sound electrodes inside her ear. 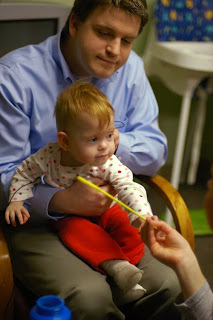 At the start of the test for each new electrode, the pulse begins at such a soft level that it is inaudible to Brynn. Then the volume gradually increases until the computer can read whether she's hearing by measuring the brainwave responses to the pulses. As soon as it gets a positive response it stops increasing the volume so as not to scare or overwhelm her, and then repeats the process on the next electrode. 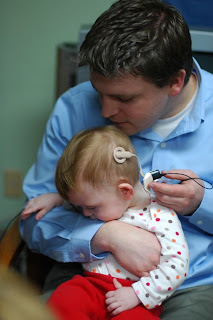 Once the audiologist has a general idea of how much power to give each electrode, depending on how loud a sound has to be for Brynn to hear it, she can set what's called a "map" for that individual ear and each individual electrode. This makes sure that sound is not uncomfortably loud--after all, we want her to LIKE hearing, not to be terrified of it. 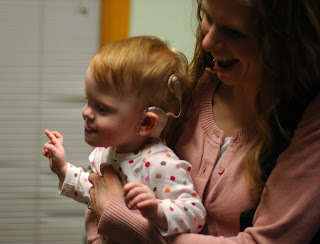 After the map is set at the audiologist's best guess for a quiet program, she turns on the microphone and Brynn can hear many of the sounds around her--at very quiet levels. Gradually, over a period of a few days or weeks, we will increase the volume of the sounds until Brynn is hearing the broadest range the CI can give her. In the video, you can see how her reaction to the first phase--hearing the computer--was to get very quiet and to concentrate on this new sensation. Once the computer was reading good brain waves, it would switch to the next electrode. At each new electrode, Brynn couldn't hear the first very quiet tones and so she would instantly relax and start looking around again. After getting home, Brynn wasn't such a fan of all this new equipment. She got pretty fussy and upset--not when she heard sounds, but whenever the implant fell off or had to be put back on. So the plan for tomorrow is to make some adjustments and start again from a lower level so changes between hearing and not hearing won't be so drastic. This is certainly going to be an experimental process for all of us, but we're confident Brynn will eventually learn to like her new bionic ears. We love our little gem. What a miracle and a blessing that science can do that for your little sweetie. I'm just astounded. I loved watching her "concentration face." And of course her giggles and smiles when she could hear everyone. Thank you for sharing this momentous day with us! Again with the tears you are making me cry!! Rejoice, rejoice!!!!! I am so happy for you guys. The video is amazing to see her really concentrating, taking it all in, and then can tell when it is inaudible. What amazing technology. I can't wait to hear how she progresses with her new ears. Congrats, guys. Yay! I am so excited for her! Happy day! I hope she's feeling better today and adapting well. I am so happy to hear she is adjusting OK to the sounds. It was fun seeing Matt holding her because I could see some of his expressions in her face. That's so exciting. I can't wait to read about how it continues to progress for her. I hope it is nothing short of miraculous! I agree with Katie! that was my favorite picture when Matt and Brynn are making the same face!!! Thanks for putting the video up! I am so happy, and tearful!!! love you guys!! Simply amazing! Thank you for sharing this special moment. Natalie and Matt. I am so happy to see how well Brynn is doing. What a little miracle. I cried watching that video. Miss you all and hope to see you soon. God is good. Many thanks for sharing your blessed event. Congratulations on this wonderful medical miracle. It is just absolutely amazing what can be done! We recently found out about an eye surgery that can be done for Dawson to possibly improve his vision. It's a new surgery but the progress the medical profession is making is incredible. Your family is so strong. Continue with your positive attitudes and strength. You are amazing people! That is so awesome. I got all choked up watching the video. What an amazing thing technology can do. We think of you often and love you very much! What incredible things doctors can do today! 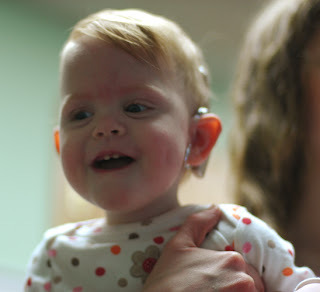 I'm so glad Brynn is adapting well to hearing in one ear. We need to get together an chat more! Dinner? Thank you for sharing your beautiful life with us, your blessings and struggles. You are always an inspiration. I'm so happy for baby Brynn. What a joyful day!!! I finally got a chance to catch up with everything and I am so thrilled Brynn has done so well. Your blogs are also so informative and explain things so well. I am so thankful you have kept everyone informed on your progress, thank you! That's so amazing Natalie! Just amazing and absolutely wonderful! She's such a cutie.